"One of the miners coming out to lunch at noon brought with him to the superintendent’s office a stone mortar and a broken pestle which he said had been dug up in the deepest part of the tunnel, some 1500 feet from the mouth of the mine. 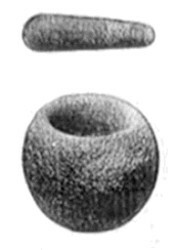 Mr. Neale advised him on returning to work to look out for other utensils in the same place, and agreeable to his expectations two others were secured, a small ovoid mortar, 5 or 6 inches in diameter, and a flattish mortar or dish, 7 or 8 inches in diameter. These have since been lost to sight."